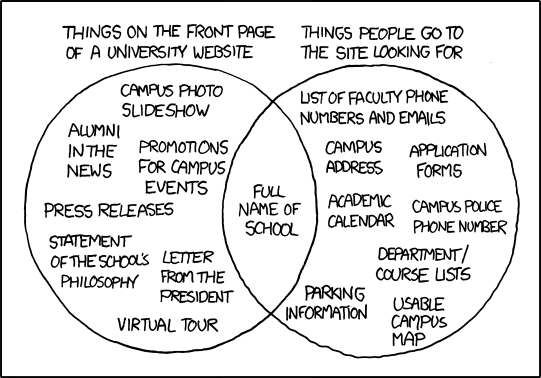 For anyone who has worked on a University website committee, the venn diagram below is very recognizable! Another great XKCD cartoon. These are the same committees that spend time discussing elitist games like gowalla and are not even aware of QR codes? Christian, Thanks for the link to the excellent Higher Ed article! Having worked on a few website committees over the years, it has alway been an institutional tug of war over what is included on the home page and main navigation bars. Ted, what I’d love to see is the next iPod Touch to have a built in camera. That would make things like Gowalla and QR codes usable for almost everyone on campus, without an $80 per month cell phone bill. For my older kids I’d love to get them a iPhone or Android phone, but not sign up for a data plan, and have them use wifi only for data. The cell phone companies don’t want this, but I’d pay $200 or $300 for an Android phone for my kids (not on a contract), and let them use a $20 month to month plan for limited voice minutes and unlimited texting… when the are in a wifi area, then they can check Facebook and do email.